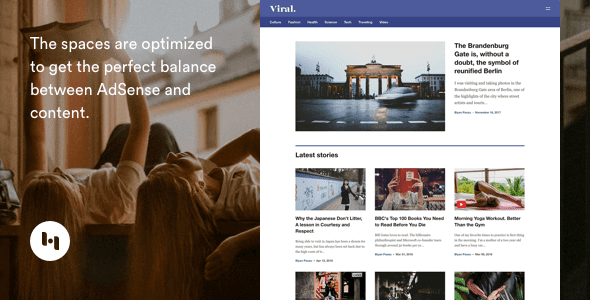 With Viral you can make a stunning Blogger-powered magazine or news blog with ease. It features clean grid-based layout, flexible popular and featured post gadgets, video post styles, smart customization options and contact form ready. Using the handy color and font pickers in the Theme Designer, you can tweak the look of your site in real-time, no code required! Viral makes it easy for you to put AdSense ads on your Blog without needed to understand code. The spaces are optimized to get the perfect balance between adverts and content. With specific boxes installed for AdSense on both Home-page and article-page, you can generate revenue from advertisements without downgrading the reader’s experience. Viral isn’t limited to create a viral site only. Whether you want to build a travel blog, DIY website, food-related blog, or even a personal site, it will fit perfectly.